“I first saw Charles in 1986 at the New England Golden Gloves tournament where he defeated two of New England’s better amateurs at the time, Patrick Ireland and Mike Culbert. Then later in the year we were at the National PAL together and he won the title there at 132. In 1988 we won the Eastern Olympic Trials together and, for me, Charles was definitely one of the most talented amateurs of the 1980’s. Very good jab, very good right hand, he put punches together extremely well. I always admired his ability to let his hands go with volleys of six or seven shots at a time, in what appeared to be an almost effortless process for him,” said “Ice” John Scully. Murray would go to the 1988 Olympic Trials and lose to Todd Foster for a spot on the team. “There’s no way I lost that fight. He had the right people with him,” said Murray. It wouldn’t be Foster who would go onto win a world title, but Murray. “I had Tommy Parks and Hank Johnson with me as trainers and Tim Ryan as strength and conditioning. Marc Roberts was my manager and part of the Triple Threat”, said Murray. Ray Mercer, Al Cole and Murray, all won world titles in 1991, 1992 and 1993 as the “Triple Threat”! Murray’s amateur record has been listed from 78-8 to 165-5. He was the 1987 US Amateur champ at 132. From turning professional in February of 1989 to May of 1990 he won all of his 15 bouts, 10 by knockout. In July he had his first big test against Alfredo Rojas, 17-4, of Venezuela. “I stopped him in the fourth. He was a very good puncher,” said Murray. Just two fights later he defeated Micky Ward, 21-4, for the USBA lightweight title in his hometown of Rochester winning almost every round. After defeating David Taylor, 18-12-3, over 12 rounds in a title defense in Atlantic City, Murray stopped well regarded Bernard Gray, 21-3, in 6 rounds in Rochester. A straight right and a follow-up right uppercut and down and out went Gray. He was now 20-0 with 13 by knockout. In an attempt to add the NABF title to his USBA title he fought Terrence Alli, 46-7-2, the former two-time world title challenger in Rochester in May of 1991. “I lost a split decision and know I didn’t box enough,” said Murray. 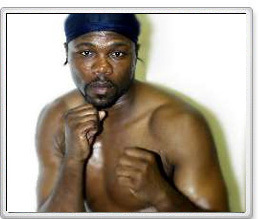 After two knockout wins including Carlos Bates, 24-2, he would step up to battle former WBA lightweight champion Livingstone Bramble, 31-7-2, in Atlantic City’s Convention Hall, before 4,500 people. He almost scored a shutout in winning over 10 rounds. In July of 1992 Murray took on future WBO champ Sammy Fuentes, 23-9-1, in Atlantic City, and won over 10 rounds. “He was a very good puncher,” said Murray. He would win three more fights including stopping Juan Ramon Cruz, 17-4, and defeating Tony Martin, 27-3-1, over 10 rounds. Martin had a 12-0-1 record in his previous 13 fights. “Martin fight was rather easy,” said Murray. This set the stage for Murray to fight for the vacant IBF light welterweight title in Atlantic City against Philadelphia’s “Rockin” Rodney Moore, 33-7-2. The boxer they called “Mr. Blue Horizon” was 21-1-2 in his previous 24 fights. The judges had it 115-113, 118-110 and 116-112. “It was a good fight and I received Charles Murray Day and a key to the city. I missed getting a parade. Oscar (De LaHoya) was about 5-0 and he got a parade in Rochester but not me,” said Murray. “What I remember about the fight is that it was a good fight, it was a tough fight, and at that time most boxing experts stated that me and Murray were the best two Jr. Welterweights on the planet fighting for the prestigious IBF championship of the world,” said Rodney Moore. He had wins over Rojas, Bramble, Fuentes and Tony Baltazar. “Murray wasn’t a hard puncher but he was a slick boxer. He had good lateral movement and slipped punches well. He also punched good to the body. It was a hard fought championship bout, but if he wasn’t part of the Triple Threat and had super trainer Tommy Brooks behind him, I would have gotten the fair nod of becoming IBF world champ,” said Moore. He felt most ringsiders thought it could have been a draw. He would challenge WBA champ Frankie Randell two fights later and Felix Trinidad two years later losing in both title attempts. Murray would have successful title defenses over former WBC 126 champ Juan La Porte, 39-13, in Atlantic City over 12 rounds and Courtney Hooper, 30-3, stopping him in 5, both in Atlantic City. It was 11 straight wins for Murray at the time. In April of 1994 he would lose his title to Jake Rodriguez, 23-2-2, by majority decision, in Atlantic City. “It would two years later by the time I got my rematch and we were fighting for the NABF title,” said Murray. Murray would stop Rodgriguez in 7. In October of 1994 Murray would lose the first of two fights with Ray Oliveira, 22-5. He would bounce back in early 1995 with a win over Jimmy Deoria, 20-3, in Rochester. “I will never forget that jab. He threw it from so many different angles,” said Deoria. Next up was a stoppage in 6 over Fitz Vanderpool, 11-2-1 before getting another NABF title shot against Reggie Green, 20-1, in October stopping him in 2. In early 1996 Murray defended the NABF title over former WBA 135 champ Tony Lopez, 45-6-1, in Rochester over 12 rounds. “He was tough,” said Murray. Next would be the win over Rodriguez. In early 1997 in a rematch with Bramble, 38-18-3, Murray would win his seventh straight. He would then lose his NABF title in a rematch with Olivera, 29-5, in West Orange, NJ. Murray would bounce back a month later defeating highly regarded Israel Cardona, 25-1, at the Roxy, in Boston, by split decision. In September of 1997 he took on Alfonso Sanchez, 16-1, who had just lost to Ward. He would lose in 3 rounds and never quite be the same “Natural”. Sanchez would go onto lose to Vince Phillips in a title bout six months later. Murray would be off a little over a year and come back as a welterweight and win 4 straight, 3 by stoppage over average opponents. He would then lose 3 straight to good opponents like Larry Marks, 20-3, Alfredo Cuevas, 19-4 and Robert Frazier, 268-5-2, being stopped by Cuevas. When he came back in 2004 after a 15 month lay-off and lost a decision in 6 rounds to Darien Ford, 9-7, in a light middleweight bout he knew it was the end. “Charles was a very solid fighter. People thought he could be a guy on the p4p list,” said Danny Serratelli. (Brickhouse Boxing) Murray’s final record was 44-9, with 26 knockouts. “I still maintain a good friendship with Al Cole and Ray Mercer. I’ve been asked to train Willie Monroe, Jr., 10-1, who lost his last fight,” said Murray. Speaking of Cole, he and Murray were inducted together into the NJ Hall of Fame in 2007. “He was an outstanding amateur as well as a professional. With his wins over Bramble, Ward, Moore and LaPorte, it shows just how good he was,” Henry Hascup. This is from the President of the NJ HOF.